I have become a little obsessed with my leafy green vegetables. I've always found ways to sneak in spinach or broccoli florets into meals but lately I've been trying to rotate other veggies in for more variety. Nowadays our refrigerator has been crowded with some scrunchy bunches of kale and unwieldy giant leaves of Swiss chard. Swiss chard is high in vitamins K, A, and C as well as a good source of tons of other vitamins and minerals including potassium, calcium, and magnesium. Sauteed, this vegetable is not bitter to taste like spinach sometimes is and there is almost a sweetness to it, especially if you add a splash of cider vinegar during the cooking. tofu, nutritional yeast, and Swiss chard are essential. It has been hard to sell my kids on the delicious, healthy goodness of Swiss chard when it's presented by itself. No matter the vegetable, one look at a heaping plateful of the stuff sends my kids running for the hills. So I looked and found a simple recipe for a vegan quiche to soften the leafy green blow. Nevermind me. I only have a week and a half to pack for a trip, go to the gym as many times as humanly possible to prepare for said trip in tropical location, do several (more than I need mention) loads of laundry, clean the house, do all of my room motherly duties, not to mention my motherly duties, with a new fascination for redecorating the house, and oh, I just found and promptly plucked a white hair. And my daughter turns 3 in three weeks. My precious, darling only little girl who is growing up right before my eyes, wants a princess and prince party filled with every kind of chocolate-filled sweet imaginable, pink and blue decorations, and all her friends around her to celebrate. And gosh darnit I am determined to give it to her. I'm just not sure how I'm gonna pull it all off, at this point. The best I've done is collected a few photos for inspiration and thought a bit about an easy, kid/adult/allergy friendly menu that would please everyone. Key word: easy. If I'm going to spend a week baking treats, I am not going to want to stay up all night cooking, too. There were a few menu items that were pretty popular at last year's party, that I'll consider preparing again, including BLT's (with Vegenaise & dairy free bread, note Iron Kids is no longer dairy free), soy butter and jam sandwiches, and Tofutti Better Than Cream Cheese and smoked salmon sandwiches. I may also add my Bean and Bacon soup, which any soup lover in her right mind will appreciate. Add to that some fresh fruit, veggies with hummus, and an easy salad, and voila! A feast fit for Cinderella herself. We've had the most beautiful spring weather in the city for the past few weeks (yes, only in San Francisco--spring in the winter, winter in summer, summer in fall!). I never wanted it to end. 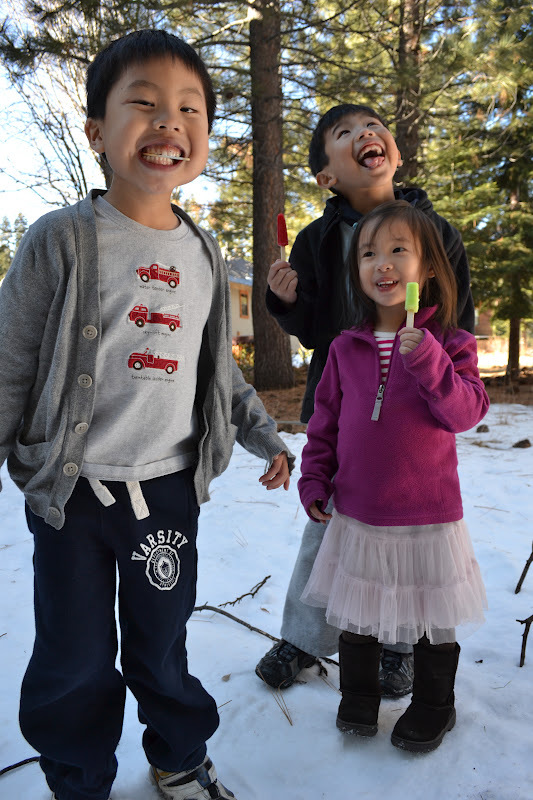 A far cry from eating popsicles in the snow! But alas, our frigid, wintry weather finally arrived. The kind of cold that cuts right through your pants, and makes you cringe when the kids peel off their essential layers once they step foot on the playground. The good news? The weather inspired me to make one of my favorites--Bean and Bacon Soup. Don't let the bacon scare you. You can sub with turkey bacon, tofu, or leave it out and add the broth of your choice instead of water. I pile in the veggies--I just add as much as I want. You can decrease the water a bit in anticipation of the water boiling out of all those veggies. I made a double recipe so I could bring some for a friend. 1. In a large pot or saucepan, fry the bacon until crisp. Remove and drain on paper towels. Let cool, chop, and set aside. 2. Over medium heat, add the carrot to the pan drippings in the pot and saute for 5 minutes. Add celery, onion, and garlic, stirring well and cooking for 3 minutes more. 3. 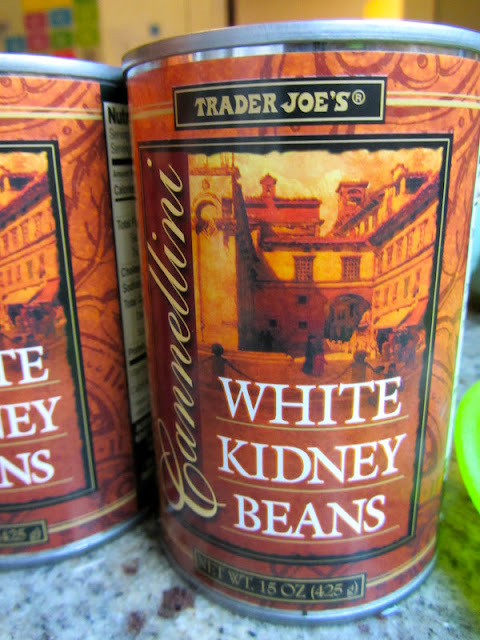 Add the beans and 2 cups of water. Bring to a boil, cover, and reduce heat to low. Let simmer for 10 minutes. 4. Uncover and, with a potato masher or large slotted spoon, partially mash the bean mixture until it thickens slightly. 5. Stir in the cilantro, salt, pepper, and bacon. Serve hot. I mentioned in a recent post that we had visited our allergist, Dr. P, for my kids' yearly check-in. Aside from re-testing for milk, peanut, tree nut, and a couple random allergies, I was curious to hear what my allergist, Dr. P, had to say about Callan's and Ryken's accidental ingestion of a baked good that contained butter. It happened in July while camping in Yosemite -- with zero cell reception, to my horror -- but both boys had absolutely no reactions -- to my shock. Did this mean severely-allergic Ryken was safe to eat milk in baked goods now? Dr. P also wanted to know about other reactions to milk that he has had in the past year. I told her about Ryken eating the salami that had nonfat milk powder and how he developed a rash around his mouth, some tongue-tingling, and abdominal cramps even after Benadryl was administered. How much did he have of the salami? Was milk the only questionable ingredient? While Ryken's no-reaction consumption of the baked good was encouraging, Dr. P emphasized that this didn't necessarily mean that he would be completely fine with all baked goods. His reaction was very situation-specific and we would need to recreate the exact ingredients, amounts, and baking temperature to be more confident in the safety of adding milk products into baked goods. Much of the milk protein has been removed in the process of making butter so this could explain why some milk-allergic people can tolerate butter products but not more milks and cheese products which are more protein-rich. In addition to Ryken's allergic reactions in the past year, Dr. P and I also talked about advances in allergy research. A team of doctors at Johns Hopkins School of Medicine recently studied the effectiveness of sublingual and oral immunotherapy as methods of desensitizing subjects from their cow's milk allergy. Sublingual immunotherapy is a type of allergy treatment in which small doses of liquid protein (in this case, liquid milk extract) are placed under the tongue. In oral immunotherapy, subjects ingest the allergen (dry milk powder was used) in gradually increasing amounts. The Johns Hopkins study had some subjects undergo only sublingual immunotherapy while others were treated with sublingual then oral immunotherapy. Of the subjects who also received oral immunotherapy, half of the group gradaully built up to ingesting 1 gram of milk daily and the other half received 2 grams of milk. To test the effectiveness of the therapies, subjects were challenged with 8 grams of milk after 12 weeks of therapy and then again at 60 weeks. 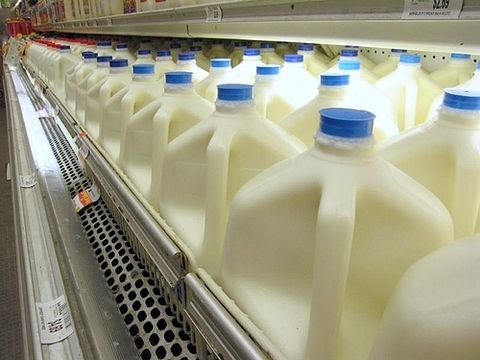 Of the three therapies, the group that received sublingual and oral immunotherapy with a higher daily dosage of dry milk protein had the highest rate of passing the milk challenge. Dr. P had attended a conference last year at which researchers at Johns Hopkins had shared these findings. Oral immunotherapy looked to be the answer to our food allergy prayers. Dr. P and her peers were equally excited about the promising results of the therapy and couldn't wait to get the green light on beginning therapy on their own patients. However, the lead researcher who presented the findings cautioned allergists from jumping into therapy just yet. The therapy was successful in enabling many subjects to eventually consume milk products. For subjects who passed the 60-week milk protein challenge, therapy was discontinued. Sadly, a follow-up study of "graduated" test subjects found that 6 of the 15 who had participated in some form of oral immunotherapy (1 gram or 2 grams of dry milk protein) became susceptible to allergic reactions again. 2 of these 6 became reactive again to milk protein only after being off the therapy for one week. The comeback allergic reactions were more serious for subjects who underwent oral immunotherapy than for those subjects only exposed to sublingual (under the tongue) immune therapy. I assume this is because oral therapy exposed subjects to larger amounts of milk protein. The more exposure to allergens, the more powerful the body's response in trying to attack it. Researchers are not sure what is going on. It seems that test subjects were susceptible to relapsing into allergies if they did not keep up with a certain level of daily milk intake on a daily basis. However, it is not clear to researchers how much and in what form milk must be maintained in the body to avoid stripping subjects of the benefits of the therapy. Fear not, Soy Dream! We have not foresaken thee for milky pastures! I can see how this is a dilemma especially for kids. Heck it's tough enough for me to remember to drink enough water everyday and sometimes I eat less fruit than I ought to be eating. But lucky for me, aside from my overall well-being, there is no immediate risks to me if I slack. My kids, however, could potentially revert back to their milk-allergic selves if they didn't have enough milk within a certain frame of time. Would they need to follow a routine like taking medicine in the morning, where I'd hand each of my sons an 8 oz. glasses of milk and they would have to diligently drink every last drop and hope it's enough to activate their daily "milk allergy armor"? I certainly couldn't send milk with them to school and expect that they would be conscientious about finishing it. If you have school-aged kids or teach them, I don't need to tell you that lunchtime and snack/recess is all about maximizing their playtime; most kids rarely finish their lunches and my son's bare-bones lunch of a sandwich/half an apple/water always comes back with leftovers. With such uncertainty and the added threat of more severe reactions from increased exposure through oral immunotherapy, it is too risky for allergists to begin such treatment on their own patients. More research must be done before a course of therapy can be adopted. So in my world, milk products are still off-limits. A bit of a bummer when thinking of all the birthday cupcakes we will once again need to pass on but really not a huge deal. I'm used to making all our food. I actually like it (except for all the dirty dishes!) so it was just an "Oh well", two-second reaction from me. My kids were definitely more disappointed than me. Ryken, who is 6 and now a regular in the birthday party circuit, was hoping he would finally be able to have the same special sweet treats as his peers. In recent months, his phrase of choice has been, "IT'S NO FAIR!! <insert pouty face>" Food allergies with its limits on what the kids can freely eat do indeed garner its rightful share of "no fairs". But I'd rather take safety than fairness. Yogurt Parfaits and Smoothies: Perfect and pink ways to greet the loves of your life on Valentine's morning. What's more, these make for a simple and nutritious breakfast! 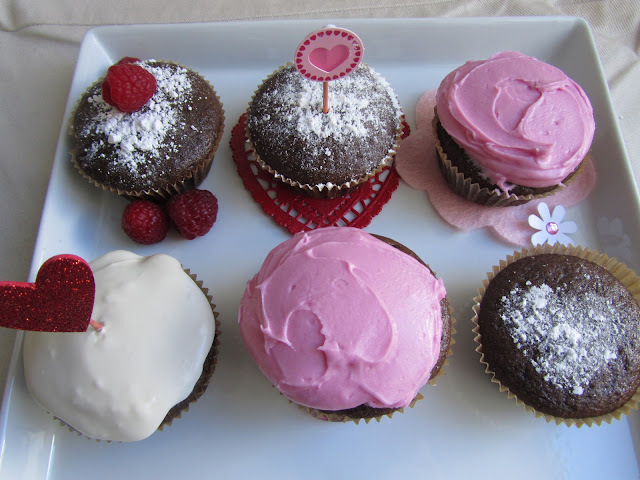 Cupcakes: Spruce up your favorite cupcake recipe (ours is Wacky Cake) by adding some festive colors and hearts. Dairy-free, Egg-free Tiramisu: Okay, so this recipe involves a few steps with some wait time in between. This may be too late for Valentine's Day but there's nothing wrong with some post-Valentine's Day celebrating with this extra special labor of love. Cut sandwiches, pancakes, and tostadas into heart shapes. Or arrange cut-up fruit in heart shapes in your kids' cereal bowls. 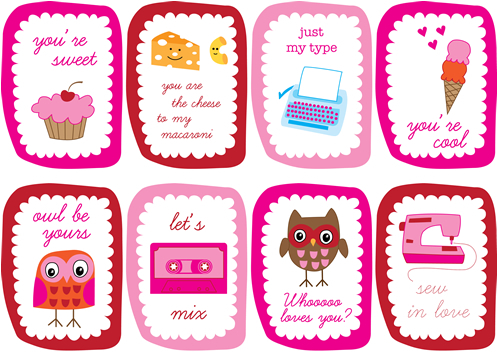 Slip in a handwritten Valentine in your child's lunchbox. Including an old photo of you with your child will earn you extra hugs! Add a little red to each meal. If not with vitamin-rich strawberries or raspberries (frozen or fresh works), bell peppers, tomatoes, or other produce, include a red napkin as a reminder of the special day. There have been moments (there have been many, in fact), where I've passed a bakery or cafe with specially prepared treats and wished for a day I could spoil my children with something sweet. I know that most bakeries aren't safe for my food allergic children, and that their world of baked goods depends on what is baked in my own kitchen, or by a handful of allergy-safe bakeries. Luckily for my children, I love to bake (driven by my own sweet tooth perhaps?). And many thanks to Martha, who's brought the cool back to homemade. In fact, there's a whole movement in the blogging world toward DIY and going homemade--clothes, bags, printables...you name it, it's out there. 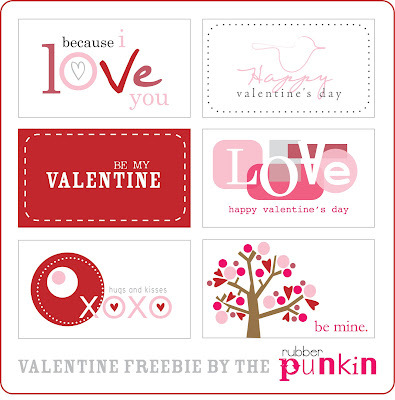 If you search, you will find, and I came across some adorable printables just in time for Valentines Day. 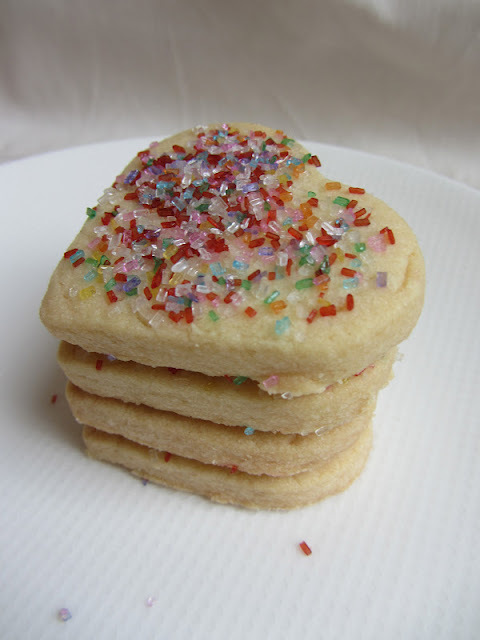 So if you're dreading finishing up your children's last 15 Valentines in the next 12 hours, or you're looking for something to dress up your shortbread heart cookies, look no further. Here is my compilation of some of the most darling (and unbelievably...free!) 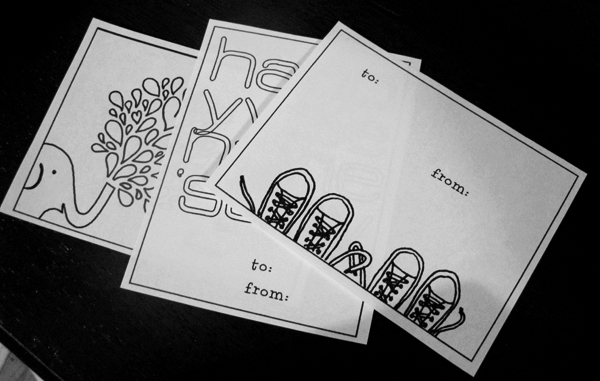 printable cards and labels in the blogosphere. Happy printing! We are knee deep in red paper, heart stickers, and lace doilies, as I have all of our Valentine card making materials occupying a good third of our dining table. 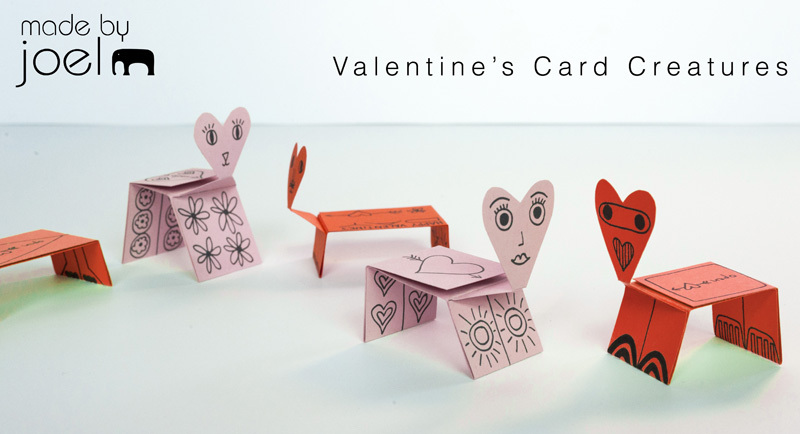 I always look forward to helping the kids get inspired and excited about Valentines Day. This year in particular, Addison is enjoying every minute of the pink glitter and rose colored paint. Of course, I also find myself baking batches of heart cookies to offer a vegan and allergy-friendly option for the kids' dance program fundraiser. No, I don't need another item on my plate. But when these types of opportunities present themselves, I can't help myself. Handing the kids the five dollars to buy a bag of cookies (for a good cause, no less) is entirely worth all the mess, clean-up, and chaos that occurs as I try to keep the kids occupied while I bake, but I also love the challenge of showing people how delicious allergy-friendly treats can be! I have to admit, I hadn't made this recipe in a while. If I'd had any hints or advice, I'd forgotten them by now. So start from scratch is literally what I did. This recipe comes from my favorite allergy book, "The Parent's Guide to Food Allergies" by Marianne S. Barber. I must remember to write a book review about this book because I really find it a valuable resource. Among other things, it's got a great recipe section, with recipes that you will find yourself using over and over again. The three ingredient recipe that follows is Barber's Shortbread (Version 1). 2. Combine flour and sugar, and cut in margarine until mixture resembles course crumbs. 3. Form into a ball and knead until smooth. 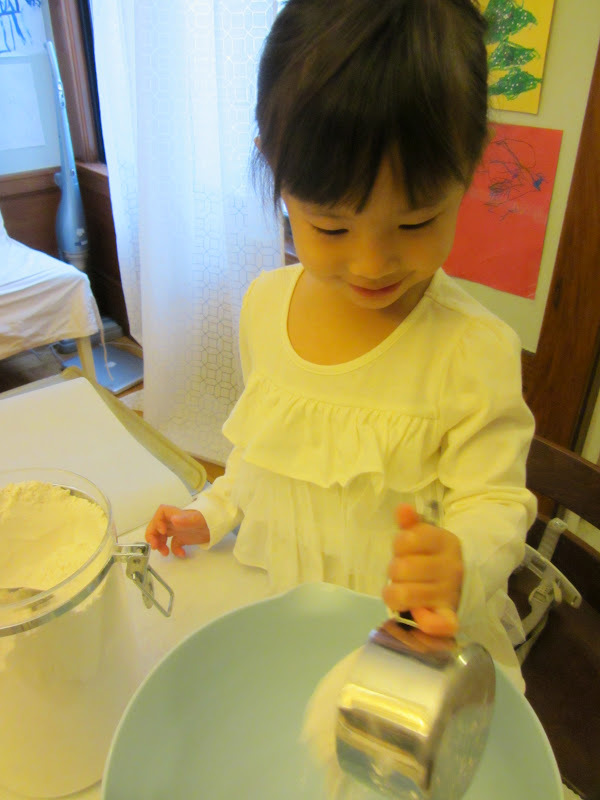 It took quite a bit of kneading and elbow grease to get a smooth consistency. Even after that, the dough is more crumbly and stickier than other dough I'm used to. 4. Roll out carefully on a very lightly floured board and cut into shapes. Originally, I wanted to use some large cookie cutters I had, but because of the crumbly and soft texture of the dough, it was impossible to get a clean cut out. I ended up using a 2" heart cookie cutter with a 3/8" dough. The thinner dough wouldn't hold up. Also, keep your dough lightly floured as you roll it out, and the sticky bits off the rolling pin. 5. Place 1 inch apart on parchment-lined cookie pans. 6. Bake for 20 to 25 minutes or until bottoms begin to brown. Makes about a dozen 2" cookies. Add sprinkles before the cookies are baked. They'll harden and stick to the cookie without the need for icing. Dip partially into melted chocolate coating. Add food coloring to dough before rolling out. A few nights ago, I awoke from a startling dream. In the dream I am walking with my sons, Ryken and Callan, trying to find my way home through a school campus. As we pass through a narrow pathway, I run into an old high school friend, something that I am wont to do in the randomness of my dreams. I am so excited to see this old friend that I quickly engage in conversation and momentarily forget that the kids are with me. Then suddenly the scenery changes and I am in someone's house. I stop my conversation because I realize that it's a birthday party and cupcakes are being served. I feel a sense of panic immediately, remember my kids, and shout out for Ryken not to take anything. He hasn't -- but looking past my high school friend, I see an empty cupcake wrapper in front of Callan. Before I know it, I'm running to find an exit with Callan in my arms and Ryken trailing behind us. I take a glance at Callan and he is moving his tongue around in his mouth, perhaps having a hard time breathing. I take out an Epi-Pen twin pack and pull one injection out but I can tell that the pen's tip is bent -- no good. I pull out the second shot and I can't get it to work right. I check out Callan again and his eyes are closed, as if he's lost consciousness. This is when I woke up from my nightmare. It took me several seconds to orientate myself, to accept that this was just a bad dream. I quietly checked out my boys who were fast asleep in their beds and tucked them in again, relieved that they were peacefully sleeping as they always do. While the emergency was imagined, anaphylaxis is a real and daily danger for me and no doubt the same for many of our Get Allergy Wise readers. This past month was particularly anxious because of real tragedies such as Ammaria Johnson's preventable death and Max's Roseland accidental ingestion of peanuts and near-fatal delayed reaction. If you have yet heard about Ammaria and Max, take some time to read their stories and share them with others. While extremely scary and sad, their ordeals can help us stay vigilant about our kids' safety. milk on a camping trip. Epi-pen Review: Take out your Epi-pen trainer and go through the steps. Do it as review but also to gain more comfort. I model this for grandparents, babysitters, and I model this for my 6-year-old and have him practice as well. While he doesn't feel comfortable yet with the responsibility of self-administering in the event of an emergency, he understands how important it is (for his and his brother's safety) to know how in the event that knowing adults are incapacitated. Make sure your food allergy action plan is current and in the hands of all caregivers, teachers, and school office staff or nurses. If you do not have one yet, make an appointment with your child's doctor so you can complete it together. Retrain all possible caretakers on how to read labels. Food Allergy & Anaphylaxis Network (FAAN) has printable sheets for each of the top 8 food allergens that can help you identify ingredients to avoid. Print sheets to keep handy at home, your cars, schools, and in caregivers' homes. At our house, the rule is that the kids are not to eat anything new that mom or dad have not personally approved. Include kids in your own process of determining the safety of the foods they eat. While you grocery-shop and when you're pulling something out of the pantry, model for them the safety measures you take. When I read labels, I use my finger to slowly read each line. When vetting new foods, I do a second read from bottom to top -- I read it in a different way to make sure I didn't skip anything the first time. As I do this, I talk with my kids, narrating what I'm doing and why I'm doing it. This educates kids who are growing up faster than we want to believe and can do themselves. Now that my 6-year-old is a strong reader, we share the responsibility of reading through labels. I give him a package for reading, and I double-check it. Kids shouldn't eat food that isn't checked by their parents, true. However, it's important to start teaching older kids who can read how to ask about foods/read labels. As kids grow older, they spend more time out of our care at school, extracurricular activities, or friends' houses. We can't always be there to ensure that they are making good choices so it pays to empower them with safe practices as early as we can. Arm kids and their belongings with allergy identification for those situations when caregivers can't be there and when kids cannot speak because they are too young to advocate for themselves or too affected by a reaction. 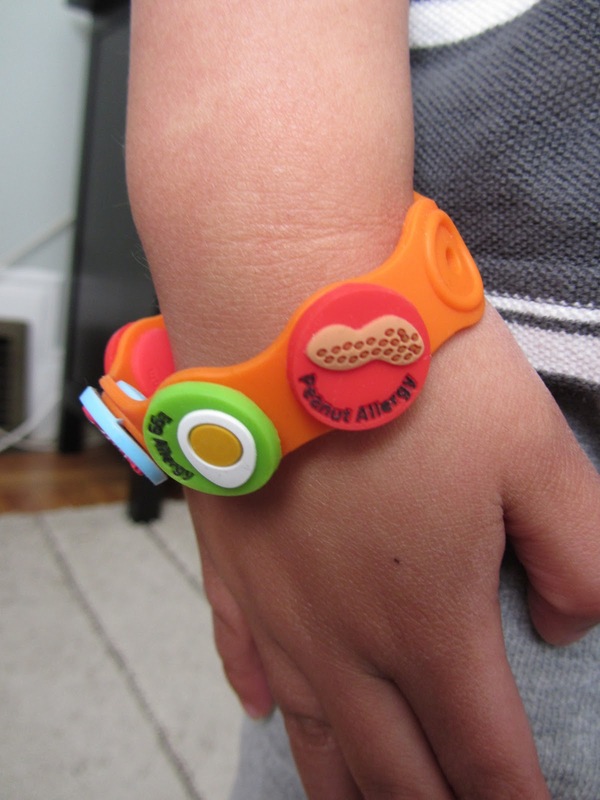 Check out allergy jewlery such as STATkids bracelets, Allerbling bracelets and stickers such as Allergy Alert Stick-ons. Include basic information on who to contact in the event of an emergency. Teach kids how to decline food; not only politely but in a manner that clearly gets the message across that they have food allergies. "No thank you. I have food allergies. My mom and dad need to check if that's safe for me." or "No thank you. I have food allergies. I have my own food." Do you eat out? Invest in translations of allergy alerts for your favorite foreign cuisines. Check out Select Wisely translation cards and Allergy Translation cards. As we prepare for the inevitable food-filled Valentine's Day class celebrations and birthday parties, it pays to revisit your safety measures. As parents with kids with food allergies, I want my kids to enjoy these occasions just as others do. And I want to do all that I can to prevent my nightmare from ever becoming a reality. on allergy symptoms, emergency instructions, and phone numbers. since the boys do not have a kiwi allergy. Guacamole and Hummus Dips: Everyone loves a good dip! Cranberry Avocado Salsa: A twist on the traditional favorite. Superbowl Snack Stadium: For the ultimate in Superbowl snacking! Knorr Vegan Spinach Dip: So delicious, no one will know it's dairy and egg free! Corn and Chickpea Chowder: Whip up some chowder in your slow cooker. Furikake Chex Mix: Easy and fast to prepare, but so addictive! Kale Chips: No guilt munching on a vitamin-rich superfood! Barbecue Chicken: With some light prep in the morning, you'll have a tasty, easy main meal for game time. Pair it with your favorite safe hamburger bun. Want more? Find even more snack ideas! Allergy-friendly Chipotle is offering half off burritos on your online or fax pre-order or 6 or more Burritos-by-the-Box on Superbowl Sunday only. Plan ahead and get in on this deal. Check out Chipotle's website for their at-a-glance guide to allergens in their menu. Call Hot Sauce and Panko in San Francisco to order half or whole trays of chicken wings. They use wheat in their panko batter, but no nuts, dairy, or egg go into the fryer. We order trays of Naked Wings--crunchy, hot, moist. Try one of their other 12 varieties (but ask about allergens in their sauces first)--SO good. They will only take phone orders for Superbowl Sunday, so get dialing before the wings run out. Corn and Chickpea Chowder -- hearty bowls of goodness, free of the top 8! Ahhh...February. Busy days, cold nights, and Super Bowl Sunday. All perfect excuses to bust out the slow cooker and get my soup on! When my family lived a short time in Seattle, we loved visiting Pike Place Market on the weekends. If you aren't familiar with Pike Place Market, it's a public market overlooking the waterfront that houses local merchants, crafts and farmer's markets. You can find stands making hot donuts, vibrant freshly cut flowers, retro toys from your youth, and huge fish being hurled through the air. The market itself is surrounded by a neighborhood that boasts the original Starbucks and other small businesses. It's a charming, warm place with lots of yummy options, too! One of my family's favorite spots near the market was Pike Place Chowder. In addition to seafood chowders and bisques, Pike Place Chowder was also creator of a very popular vegan chowder. The chowder was so rich and creamy, it was hard to believe it was dairy-free. I remember asking and, um, re-asking (excessive but c'mon -- I've got a milk-allergic boy!) to make sure that there was absolutely no milk, no cream, no butter, no dairy of any kind in the soup. Nope. None of it. I miss that chowder and a bunch of other things about living in Seattle but, make no mistake, I am thrilled to be a Californian again. I'm grateful for having sun and warmth most all year long. The nights have been getting chilly around here, though, and it reminded me of the warm bread bowls of vegan chowder. I decided to try to recreate the chowder experience in a safe way for my milk-allergic, nut-allergic kids. This recipe is also free of wheat (gluten), soy, and animal products -- in other words, it's completely devoid of the top 8 allergens. Warm chowder paired with Isa Moskowitz's sweet potato drop biscuits from her book Appetite for Reduction. Don't be scared off by the lengthy list of ingredients. It's an easy soup to prep for the slow cooker (took me about 15 minutes) and the beauty is, when you get home at the end of the day, it will practically be ready to serve! If you don't have a slow cooker, you can toss everything into a big pot and simmer for 45 minutes or so. For extra flavor, you can saute the vegetables prior to cooking the soup with the liquids but this will add to your clean-up and cooking times. For thicker soup, omit one cup of vegetable broth. Use full-fat coconut milk for the creamiest results. Wash, peel, and chop all vegetables. Put potato chunks on bottom of the slow cooker. Then add all other vegetables and beans. Add seasonings, coconut milk, and broth. Stir in maple syrup and some salt. Cover slow cooker with lid. Cook on low heat for 6-8 hours or high heat for 3-4 hours. If you can, stir the pot once in the middle of the cooking time but try to refrain from checking the soup too often. Each time you remove the lid, a lot of the cooking heat escapes and this can slow down your cooking time. At the end of the cooking time, stir in lime juice. Taste the soup and add pepper and more salt to taste. Once you're happy with the taste, remove half to two-thirds of the soup from the slow cooker and blend until smooth. Replace blended soup back in slow cooker. You can keep the soup on the warm setting until you are ready to serve. Potatoes on the bottom -- they need the liquid most to cook! The soup is a hearty meal on its own but having it with some bready loveliness really hits the spot. Perhaps serving it in a sourdough bread bowl or with toasted slices of your favorite safe bread? I myself have recently become obsessed with sweet potato drop biscuits from Moskowitz's Appetite for Reduction low-fat vegan cookbook. I made the biscuits half a dozen times last month including once with a gluten-free flour blend that seemed to work okay. A little gummy, but I think I added a bit too much xanthan gum. Again, another cookbook to buy or check out at your local library!